Gamelan Raga Kusuma is an open, community-based ensemble affiliated with the University of Richmond in Richmond, Virginia. Memberships is free and open to the public. We rehearse Sundays 6-8 pm, and Thursdays 7-9 pm in our new location on the lower level of North Court, 40 Westhampton Way [map]. The entry door is at the north corner of the building, directly across from the tennis courts. We welcome interested observers at all rehearsals, and invite new members to join us at periodic open rehearsals. No prior musical training is required. 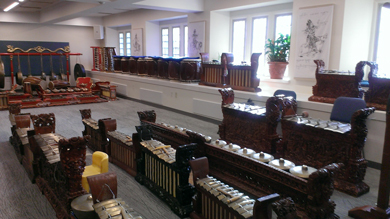 Gamelan is radically different from Western music in its structure, technique, and learning methods, so we all learn by observation, repetition, and hands-on practice. New and prospective members are encouraged to read this info packet which includes more information about rehearsals, membership, and gamelan. Current members span ages, cultures, backgrounds, and interests. We are joined by a love of music, learning, and intercultural exploration. Five of our former members have earned Darma Siswa or Fulbright scholarships to study music in Indonesia.